Slussen is the historical heart of Stockholm and the most important traffic hub with locks, subway and roads. 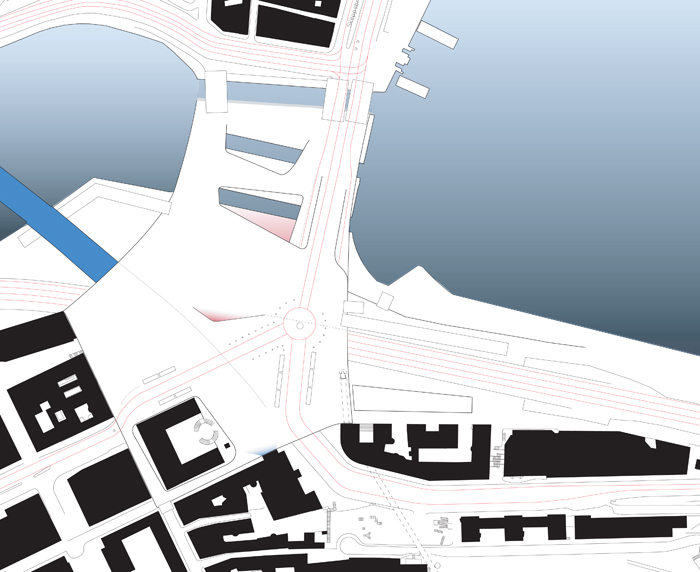 The proposal for Slussen “Öppna Slussen/Field Operation” was first presented as a master thesis at Lund University 2006. It was later presented and advocated for by the Chair of the Swedish Royal Art Academy Olle Granath together with members Jöran Lindvall och Mats Edblom. The proposal is widely published in both news and architectural media as well as presented to the City Architect and the City Planning Office of Stockholm, The Mayors office (Stadsbyggnadsborgarrådet) and the Stockholm Beauty Council (Skönhetsrådet). The curved fold reveals the subway underneath. Whats going on under the skin of Slussen? A skin is stretched between Södermalm and Old Town. The skin folds over the subway and connects and reveals the hardware of the site. Its sweeping surface is generated by topography and infrastructure. The surface explains the site, simplify movement and accentuates the beauty of Stockholm. You can roam freely, eat a herring burger on the way home or celebrate Swedens first gold medal in the World Cup. Vehicular traffic is on pedestrians premises according to the principles of ”shared spaces”. Steel ramps and bridges mark the entrance to the Slussen surface. Horizontal security fences follow the edges like eyebrows. 100.000 Stockholmers celebrate Swedens first World Cup gold medal in 2014. Through geels in the surface and ramps from the Subway the pedestrian reaches the room below the surface. Under the deck the power of the infrastructure is fully exposed and celebrated. Subway and road behind concave glass and the historical rough textures of the site create the urban stage design for shopping in pavilions.